Which teams have surprised early this NFL season? What can we say after 4 weeks of data? The Power Rank looks at NFL offense and defense through their pass statistics. My research has found that passing rules the NFL while rushing hardly matters. Here, I give the NFL rankings for pass offense and defense by yards per attempt adjusted for strength of schedule. Beware the small sample size of only 4 games, but these results do give us an early peak into the 2017 NFL season. First, let’s look at pass offense. The number gives an expected yards gained per pass attempt against an average NFL defense. The Rams as the top team immediately jumps out. Last season, the Rams trotted out Jared Goff, the first pick in the 2016 NFL draft, at quarterback and watched him embarrass himself and the franchise. The Rams finished dead last in these pass offense rankings. In the off season, the Rams got help for Goff. They traded for explosive receiver Sammy Waktins from Buffalo and signed tackle Andrew Whitworth from Cincinnati for enhanced protection. In addition, you might have expected Goff to improve. On The Football Analytics Show, Kevin Cole explained how draft position is the primary variable for explaining NFL QB success. The Rams and other teams liked Goff for a reason before the draft. But a move from last to first in pass offense is startling. Let’s see if the Rams can keep it up. Now let’s check out the NFL pass defense rankings. The number gives an expected yards allowed per attempt against an average NFL offense. Pittsburgh leads the NFL in pass defense, a surprise for a unit that has ranked 13th by these same numbers the past two seasons. The Steelers picked up cornerback Joe Haden for 3 years, $27 million, a hefty contract for a player that had just been released by Cleveland. At the other corner, they’re starting Artie Burns, a rookie from Miami. So far, so good. These pass offense and defense numbers drive my NFL predictions for totals. The Steelers look like an under team with this defense and an offense that was supposed to be elite but checks in at 20th in my pass offense rankings. My numbers predict 38.3 points for their game with Jacksonville this weekend. This is probably low, since the Steelers defense most likely regresses to the mean while the offense improves during the remainder of the season. However, there might be some value in the under. Finally, in the biggest surprise early this NFL season, New England is dead last in pass defense. This unit figured to be a strength this preseason, as they signed Stephon Gilmore to a 4 year, $65 million contract to play cornerback opposite Malcolm Butler. However, Gilmore has been awful and started the second half of the Carolina game on the bench. The Patriots have started 2-2 largely because of this pass defense. Members of The Power Rank get access to these pass defense rankings each week as well as predictions for spreads and totals for all college and pro football games. To learn more, click here. Rufus Peabody, ESPN’s predictive analytics expert who makes his living investing in the sports markets, joins me on the Football Analytics Show to discuss the NFL playoffs. He’s also half of the excellent Massey-Peabody rankings and predictions for football. Among other things, we discuss the following. You’ll find Rufus incredibly humble for someone who has had his success in sports analytics, and I’m lucky to consider him a friend. To listen on the site, click on the play button. The NFL Playoffs have arrived. Remember, there are favorites to win the Super Bowl, but no team has great odds to win three or four games in a row against the NFL’s best teams. That makes picking Super Bowl winners very difficult. It depends on both good play and luck. Nonetheless, that’s what makes the playoffs great: anyone can win. Last year featured the consensus two best teams in the Super Bowl, but I wouldn’t expect that to happen often. Finding edges in the playoffs is much more difficult than the regular season. There will be many more bets coming in and the public generally knows the worth of each team at this point. Valuing overlooked aspects like home field advantage and defense is important. Let’s try to figure out who wins this week. Over the last two seasons, the Arizona Cardinals have been the unluckiest team in the NFL. Last year, the Cardinals won ten games but missed the postseason. This year, Arizona won eleven games but lost their first and second string quarterbacks to injury. Now they travel to play a 7-8-1 Carolina team. And unfortunately for Cardinals fans, that 7-8-1 team is much better than them right now. Ryan Lindley is the go-to quarterback for the Cardinals. He has nine career games, a 50% completion rate, and just threw his first touchdown pass last week. Lindley will go up against a now healthy and very fast Carolina defense. The Panthers have given up more than 20 points in just one of their last six games and are beginning to look like the defense we saw last year. The Carolina offense, on the other hand, hasn’t been great. Sure, they scored 34 points as a team last week but that was aided by two defensive touchdowns and incredible field position most of the game. Relying upon some fortunate bounces isn’t a sustainable way to win games. Cam Newton will go up against a Cardinals defense that is a bit overrated. Early in the season, the Cardinals repeatedly found themselves in close games in which late turnovers and defensive touchdowns aided some victories. In actuality, they’ve produced the 27th best sack rate and 21st best pass defense by yards per attempt adjusted for schedule. Without being able to pressure Cam Newton, the Cardinals will find themselves in a bad situation. Newton will be able to exploit their defense on the ground and through the air. The books have the line at Panthers -4.5. Considering they are playing at home, this line suggests the Panthers would be very small favorites on a neutral field. The public will be largely backing the Panthers which should move this line towards the price of a touchdown. If you like the Panthers as much as I do this week, you may want to get them early or find another game to tease the line down with them. I like to bet on defense and home field advantage. Panthers win big. The Pittsburgh Steelers come into the playoffs flying high. They’ve won their last four games by an average of 11.5 points against solid competition. The Ravens have won three of four but haven’t played great in the last three games since cruising past the Dolphins. Baltimore slipped by the Jaguars, lost to the Texans who brought Case Keenum off the street, and pulled out a close one against the Browns led by Connor Shaw last week. The Ravens defense has been about what one would expect in those games; however, the offense has been abysmal. It all starts with QB Joe Flacco. This season, his 62% completion rate and 7.2 yards per attempt reminds you of quarterbacks named Eli Manning and Colin Kaepernick. The match up couldn’t be better for Flacco and the Ravens offense this week, though. 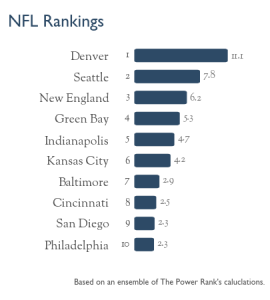 Pittsburgh rates as the third worst pass defense in the NFL, just beating out Atlanta and Chicago. That not-so Steel Curtain defense ranks 25th in sack rate and 30th in passing yards per attempt against. Look for Flacco, who hasn’t been great in road games over his career, to have some success. I do believe the Ravens best chance of advancing through the Wildcard round was to draw the Steelers. That doesn’t mean I’d pick them to win this game. The Steelers offense has been incredible. Pittsburgh has the fourth best pass offense, only trailing Denver, Green Bay, and Indianapolis. Ben Roethlisberger, Antonio Brown, and Le’Veon Bell are as good of a trio that you will find in the NFL. Bell did hyperextend his knee late in Week 17 and is likely a coin flip to play this week. I still believe they have success against an average Ravens defense with a mixture of Josh Harris and Dri Archer in the backfield. The opening line favors the Steelers by more than a field goal. The Power Rank’s ensemble predictions favors the Steelers by a point. I’ll agree and back the Steelers to win with home field advantage. This game is lined appropriately given that the Ravens offense and Joe Flacco continue to struggle this season. I am really stuck coming up with an opinion for this game. If it weren’t the playoffs, I’d pass on this one entirely. I do believe the Bengals are a little better than most people think. However, they have a large match up problem this week. The Bengals front seven will not be able to stop Andrew Luck. In the few games that the Colts offense has struggled, it’s been mostly due to pressure on Luck where he’s become turnover-happy. The Bengals have the second worst pass rush in the NFL. That’s a large mismatch since Luck takes sacks at the fifth best rate in the NFL. Luck should be able to extend plays with his legs and inside the pocket while allowing the athleticism of T.Y. Hilton, Donte Moncrief, and Colby Fleener to really shine. Cincinnati’s secondary has been impressive, recently blasting Peyton Manning into mediocrity, but stopping Luck on the indoor turf in Indy is a different story. The Bengals did take the Steelers down to the wire last week. The ten point difference doesn’t tell the whole story. The Bengals were already inside of field goal range while down three with around three minutes left in the game before A.J. Green fumbled and cost his a team a shot to win the game. In the process, Green was injured on the play and is questionable for Sunday’s contest. Green may be the best offensive player and threat for the Bengals. His potential absence or limited play should not be taken lightly. There still is a slight misconception that the Colts defense isn’t very good. They represent the tenth best secondary and eighth best sack rate. According to The Power Rank, they rate overall at tenth, right between the Lions and Patriots. Nearly every statistical aspect of this game tells me the Colts win easy. While the Colts have struggled recently, I think they play their best at home this weekend in their most important contest of the season. This agrees with the ensemble prediction of Colts by 4.8. As I’ve stated before, the Cowboys are the most publicly-driven point spread each week. I was amazed when I saw a Cowboys -7.5 pop up Monday morning. A bottom five defense is going up against an incredibly talented offense and is laying more than a touchdown in the books. If we evaluate this game at an offense versus defense standpoint, I think it’s safe to say the Lions offense is a better match up for the Cowboys defense than the Cowboys offense against the Lions defense. Detroit’s offense certainly hasn’t lived up to its talent level, but they’ve shown some flashes of what one would expect. Matthew Stafford, Calvin Johnson, Golden Tate, and Reggie Bush could give this Cowboys questionable defense some nightmares this week. Detroit’s passing offense ranks right about average; however, they’ve spent a large portion of the season without their most important offensive player, Calvin Johnson. Either Orlando Scandrick or Brandon Carr will cover Johnson this week, while the other gets Golden Tate. Both Scandrick and Carr have played better than expected this season but they still have their hands full dealing with all that speed in a dome and on turf. Stafford has struggled at times dealing with pressure and their front line hasn’t protected him at a great rate. However, the Cowboys don’t get to quarterbacks that often (4.25% sack rate). Not to mention, the Cowboys haven’t historically played great at home. Even with a substantial home field advantage, this game should be much closer than anticipated. We all know how good the Cowboys offense has been this year. Tony Romo, DeMarco Murray, and Dez Bryant are as good as they come in the skill department. They will give any defense problems. The Lions do boast the best run-stopping defense in the NFL and a top ten secondary. If the Lions secondary can find a way to stop Dez Bryant from catching multiple touchdowns this week and force Tony Romo to use Terrance Williams and Cole Beasley, they’ll have a great chance to win this game. I am not suggesting the Cowboys are much worse than the Lions. I still think they win this game with superior offensive abilities. This entire Cowboys team has been better than expected. However, the fact that the largest line of the week by a wide margin is given to the team with relatively no defense and no great home field advantage is a shock. I expect the Cowboys to pull this one out, and the ensemble predictions agree (Dallas by 2.3). Take the points. Enjoy the playoffs, all. It’s the best time of the year and it doesn’t last long. May the luckiest team win! Frank Brank founded cheapseatanalytics.com, a site devoted to analytical sports information and betting systems. He majors in baseball but also covers the NFL and NHL. You can follow him on Twitter @realFrankBrank. Week 17 of the NFL is one of, if not the hardest, week to predict outcomes of football games. You must consider which teams will play full out and which will sit starters or play cautiously. To avoid these situations, let’s focus on important games to both teams. The analysis below is based on calculations available to members of The Power Rank. The offense and defense rankings for passing consider yards per attempt and adjusts for strength of schedule, since the NFC South is just that bad. The team rankings shown in the visual aggregate these offense and defense rankings with calculations based on margin of victory. The predictions come from these ensemble rankings and add a constant factor for home field. Sadly, either the 22nd or 28th best team by The Power Rank will win the NFC South and host a playoff game. When evaluating football games, a large portion of the analysis and focus should depend upon the offensive and defensive match ups for each team. I believe the Panthers have a decent advantage on Sunday. The Falcons have the worst pass defense in the NFL. They also don’t pressure the quarterback, ranking 31st in sack rate. On the other side of the ball, the Panthers don’t throw the ball particularly well but I don’t foresee much of an issue against this defense. The Panthers offensive weakness is pass protection, as they rank 22nd in sack rate allowed despite having an extremely athletic, mobile quarterback in Cam Newton. However, the Falcons front can’t get to anyone, so Newton will have success running and throwing the ball. Contrary to popular belief, the Falcons have been just slightly above average on offense. They rank just one half of a yard ahead of league average in adjusted yards per pass attempt. Similarly, the Panthers pass defense has been just slightly above average this season. As they’ve gotten healthier and as the season has worn on, they’ve gotten better, allowing more than 20 points in one of the last five games. The ensemble predictions suggests a one point win for the Falcons. The public has backed the Falcons at a three to one rate early, moving the line from Falcons by three to Falcons by four already. I’d gladly take the Panthers north of three points with the money line having some value as well. Now that the Cowboys have clinched a home playoff game, this game will be a matter of seeding in the upcoming weeks. Like I wrote last week, the Cowboys are the most hot and cold team in the eyes of the public. If they are winning, they’re highly respected. If they are struggling, they get no public backing. Looking back on it, it’s somewhat comical that the Cowboys were four to five point underdogs at Tennessee in Week 2. I also wrote last week about the one fatal flaw in Robert Griffin’s struggles and how he could exploit the Eagles poor secondary with a little bit of time in the backfield. As the Cowboys have generated very little sacks on defense (4.6% sack rate), Griffin should be able to find similar success against a bottom five secondary. There’s also a chance the Cowboys play it a little safe in this game. Sure, seeding is important in the playoffs, but keeping everyone healthy could be equally important for an offense that relies heavily on their offensive line and just a few skill position players. There’s little chance the Redskins have given up at this point. Robert Griffin is playing for a starting job next year, whether it’s with the Redskins or another team, and DeSean Jackson definitely hasn’t taken a play off. This match up is much closer than one would expect as both teams do not play defense. The six and a half point line is too many points to lay for the slightly better defense at home. If you move this game to Dallas, this line would suggest the Cowboys to be nearly two touchdown favorites. That’s too many points to lay for a cautious team with a horrendous secondary. The Skins have another chance to win this week. The numbers agree, giving the Cowboys an edge of only 1.4 points. The game of the week is Cincinnati traveling into Pittsburgh for the AFC North Championship and the opportunity to host a playoff game. Considering how well both of these teams have played in recent years at home, this game should be of high importance to each team. Most of the public, and the books, will more than likely remember the 21-point win by Pittsburgh in Cincinnati just a few weeks ago. However, the full season statistics suggest the Bengals have better match up with the Steelers this week. The Steelers have the 4th best pass offense while the Bengals feature the 7th ranked pass defense, which is surprising. It’s safe to expect the Bengals to hold the Steelers offense under 42 points this time around. The mismatch comes on the other side of the ball. The Bengals passing game hasn’t performed as well as one might expect from their talent. But the Steelers pass defense is bad (30th) and has been exploited over the top. The Steelers have won games with big plays on offense. It’ll be a little harder this week against a good, underrated Bengals defense. A standard three points to the home team gives the Steelers a slight edge. The Power Rank says Steelers by a point. Flip a coin, the last possession determines the outcome in the game of the week. Thanks for reading. We’ll cover all of the games next week as the playoffs get underway. This week I am going to take a page out of the Fox News playbook. Hey? Where are you going? Don’t worry, I’m not going to try to sell you Food Insurance. I just want to focus this week’s discussion on the key battleground divisions the way news networks look at swing states while ignoring the rest of the country. So Rams fans can breathe easy, I won’t be taking so many shots at your team this week. Besides, you should all still be celebrating the (baseball) Cardinals victory! The NFC North is stacked with talent this year, led by the Super Bowl champion and The Power Rank leader Green Bay Packers (#1, 11.55). Normally having a team like the Packers in a division would settle matters, but this year it does not. The reason is that the Lions (#4, 5.17) are right on the Packers’ heels, and the Bears (#9, 3.78) are not that far behind. That’s three top ten teams in one division. The Lions may have a hard time keeping up their pace especially with their oft-injured quarterback having ankle problems last week, and the Bears are legendary for pulling wins out of thin air. Just ask Dennis Green! Even if the Packers’ high level of success continues and they lock up the division title early, the Bears and Lions will both still likely be in the playoff hunt, in fact if the playoffs started today both teams would receive a wildcard berth. With a lot of division games left the NFC North division is going to be an interesting one to watch. What’s with the North being so good at football? Although the AFC North doesn’t feature three top ten teams as the NFC North does, it comes very close. This division is led by the Baltimore Ravens (#3, 7.80) but they are actually a half-game behind the Steelers (#11, 2.58) and only a half game ahead of the Bengals (#12, 1.69). Now, I know nobody talks about the “top twelve” of any lists, but it is nonetheless impressive that this tight grouping all falls within the top 12 teams in The Power Rank. It’s hardly a revelation to NFL fans that the Steelers and Ravens are going to be battling for a division title, or that the loser is likely to grab a wildcard spot. What is unlikely is the upstart Bengals sticking their noses into the mix. With a third solid team to contend with the Steelers and Ravens will not be able to take anything for granted this season, and the fight for a playoff berth may get ugly in this division that is known for misconduct both on and off the field. The NFC East doesn’t carry nearly as many strong teams as the NFC and AFC North divisions do, but with some schedule oddities the team that The Power Rank picks as the clear division favorite is lagging behind in the actual standings. The Cowboys (#8, 3.85) should be running away with this division in light of the fact that their closest competition should be the Eagles (#18, -0.89) who are also struggling to find wins. Instead the Giants (#24, -3.29) are leading the division with a 4-2 record. True, it’s early in the season. And yes, we at The Power Rank do think that as things shake out the Cowboys’ record will start to match their apparent strength. Even so, with poor starts from teams with high expectations and surprising starts from teams with low ones, everyone is in the mix here and every game is going to be an especially heated contest. The Power Rank is scheduled to get some East Coast bias with our next software upgrade. If you want to hear how this is the only division that matters this year (or any other) tune into ESPN. We apologize for the inconvenience. Sure, the AFC East has a lot of strength in top ten teams New England (#2, 9.77) and New York (#7, 4.36) but in spite of what some sports news anchors would have you believe, this is not news. The addition of the up and coming Bills (#16, 0.41) is shaking some fans’ confidence in the Patriots and Jets getting their perennial playoff spots, but The Power Rank thinks otherwise. The Bills are indeed a good team right now but good is not enough in a division that has contained two top ten (and usually top five) teams for the last few years. This division will get down and dirty where it normally does (in the playoffs) with the teams it normally sends (the Pats and Jets). Until then, my attention will be elsewhere.